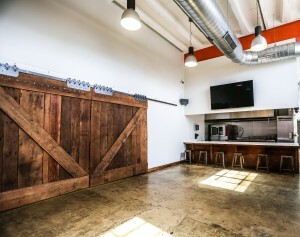 Mess Hall is a mid-century brick warehouse that has been converted into four commercial kitchens and shared by DC’s hottest emerging food entrepreneurs. 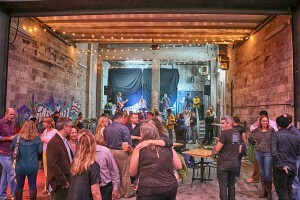 We are also home to DC’s most unique and buzzworthy venue. Our newly renovated event space boasts 18’ ceilings and a fully functional demonstration kitchen, designed to create interactive experiences and unforgettable events. Mess Hall is the only venue in the city where an open kitchen engages partygoers for a fully interactive culinary experience. Our partially enclosed Garage Bay features exposed brick and glows with twinkle lights. It offers an open-air feeling any time of year and boasts an optional stage for live entertainment. Three event spaces can be combined into one dynamic venue to complement your vision, or you can partition one area for a more intimate gathering. Over 35 local food & beverage makers on site, including: caterers, food trucks, bakers, candy makers and more! Full liquor license for wine/beer/spirits with the ability to serve 9am-2am (and 3am on Fri/Sat nights). Lots of free street parking, 1 large free lot, and 1 metered (Parkmobile) lot. 10 min walk to two Metro Stations (Brookland/CUA and Rhode Island Ave) on the Red Line.